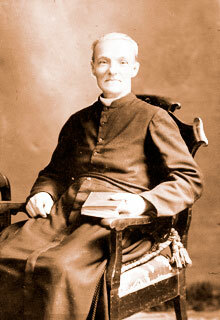 Born on August 9, 1845, Brother André (Alfred Bessette) died on January 6, 1937, aged 91. The hamlet of St. Joseph owes its association with the “little brother” to Narcisse Cantin. Both men shared a similar personal devotion to St. Joseph, the patron saint of Canada. When a chance meeting occurred between Cantin and Brother André at the St. Joseph Oratory of Mont-Royal in Montréal in 1908, a life-long, friendship developed. In 1917, Cantin obtained permission to bring Brother André back to St. Joseph for a brief vacation. This was the first of many visits by Brother Andre to the area. While visiting St. Joseph, Brother Andre expressed his desire to see a statue erected in honour of St. Joseph and even selected a site for the monument. The site of the statue is the St. Joseph Memorial Park, located at the intersection of highways 21 and 84. Erected in 1972, the monument is also marked with a commemorative plaque about Brother Andre and his interest in the community. Brother Andre continued to visit St. Joseph until 1922. In 2010 Brother André was canonized at the Vatican in Rome on October 17.